Subject: 1401_software] What are the different 1401 models? I was wondering about the different 1401 models and maybe someone here knows the details. Model C: the card and tape model. Is this what the Computer History Museum has? but I don't know in what way it is smaller. Anyone know more about the different models, especially the mysterious E and G? How is the internal layout of the different models changed? Where do the power supplies go in the A and D? It was an entry system with reduced card reading and printing speed, possibly also reduced clock speed, although not mentioned in the brochure. I happen to have a copy of IBM 1401 General Information Manual published in 1959. On page 11 there is a table describing the various models of the initial announcement. I enclose a scan of page 11. I do not know model E, nor do I remember where the power supplies were in Model A. Model B: Expanded Card Systems. Model C: 729 Tape Systems. Model D: 729 Tape/Card Systems. Model D1: 7330 Tape/Card Systems. Model E: 7330 Tape Systems. Model F: 1405 Disk/Card Systems. Model F1: 1405/729 Disk/Tape/Card Systems. Model F2: 1405/7330 Disk/Tape/Card Systems. You can also see the pricing in 1976 in these charts. "co-designer of the 1401 Model G which interleaved processing with card reading, punching and printing which significantly improved overall performance!" The power for the 1401 Model A comes from the 1402 unit, according to some of the manuals referenced below. Some limited information can also be found in the IBM 1401 System Summary manual linked in that same section. Hope that helps a little in your research. 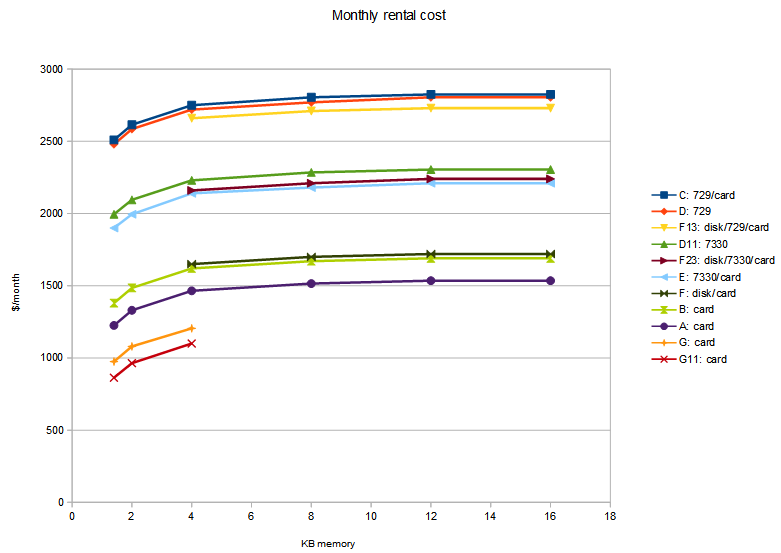 I made a graph of the 1976 rental prices in Jeff's attachment. The pricing scheme is interesting, but a bit puzzling. Basically, the price is determined by the memory and tape drive type; other things don't really matter. The top price tier is for 729 systems: C with card, D without card, and F with disk and card. The next price tier is 7330 systems: D, F with disk and card, and E with card. The next tier is systems with no tape: F with disk and card, B with card, and A with card. At the bottom are the slower G systems with card. It's a bit strange that having disk support doesn't cost anything extra, but the different tape support costs much more. Is the interface for the 7330 less complicated? I assume these prices are for just the 1401 and don't include the tape drives. The memory pricing is also interesting. Going from 1.4K to 2K costs about $105, 2K to 4K costs $135, 4K to 8K costs $50, 8K to 12K costs 20, and 12K to 16K is free. It's hard to make sense of the memory pricing. The small memory increments are much, much more expensive than the large ones. Maybe these prices don't include the 1406 memory unit, but then I don't know why you would need to pay more for 12K than 8K. Another interesting thing is the $333/month charge for multiply/divide or $11,950 purchase. Overlap is $255/month or $15,380 purchase - so overlap is much cheaper than multiply to rent, but much more to purchase. In general, the rental prices are 1.5% to 3% of the purchase price, but there's a lot of variation. I don't know anything about pricing beyond this data, so I'd be interested in comments from people who know the real story.